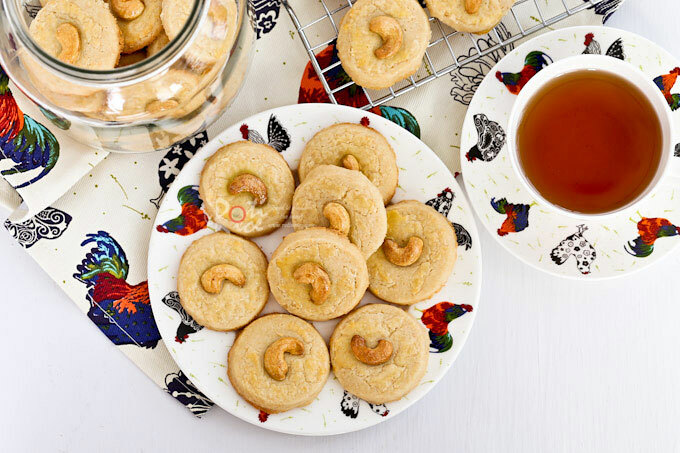 These buttery Cashew Nut Cookies have a crumbly sandy texture and a deliciously nutty flavor. Perfect for afternoon tea or the holidays. The Chinese New Year is only 6 days away from today. I am happy that it falls on a Saturday this year because that means both my sons will be able to come home for the celebration. I have more or less decided on the menu for the Reunion Dinner and have started baking some cookies. 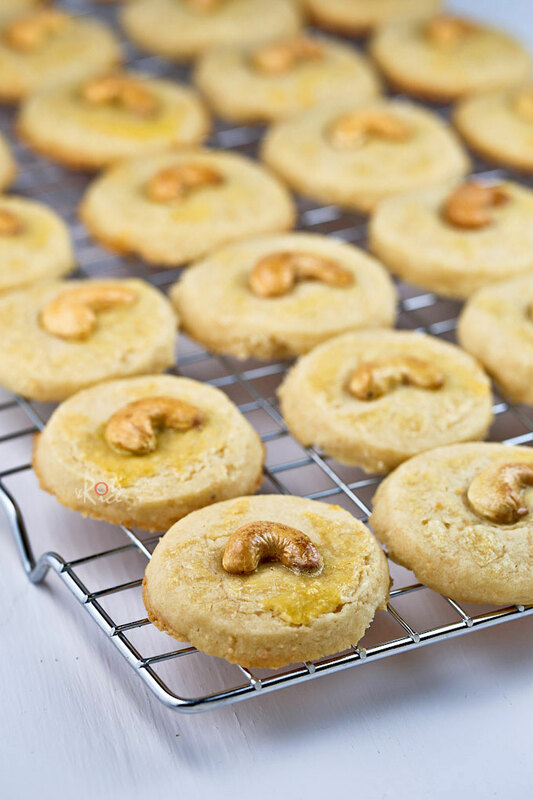 This time round I decided to make Cashew Nut Cookies which are quite popular in Malaysia and Singapore even though they are not exactly traditional. These buttery and deliciously nutty cookies are egg-free with a texture similar to that of shortbread. The recipe yields about 28 cookies and I would suggest doubling it because they tend to go fast. This post is part of a virtual #SweetLunarNewYear and #ChineseNewYearCookieParty with a group of awesome food bloggers. I hope you get to check out all the wonderful recipes listed here. 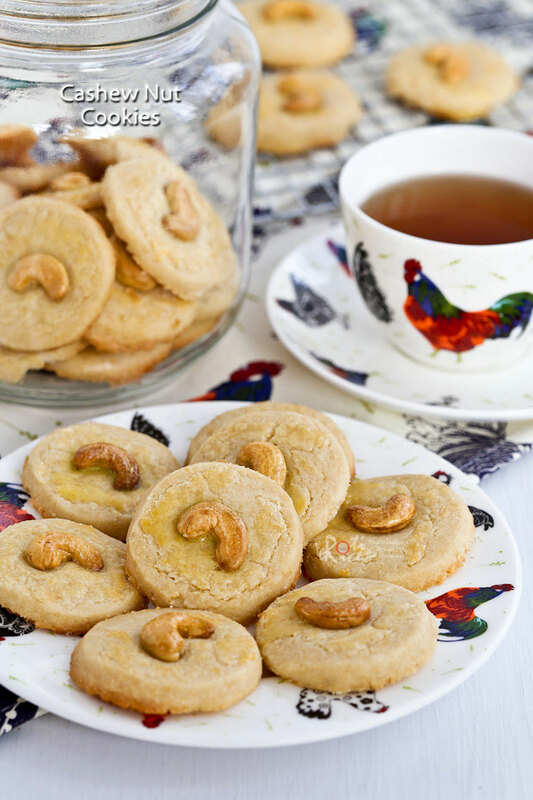 My Cashew Nut Cookies recipe is in the recipe card below this list. My other blog, Malaysian Chinese Kitchen is also a participant with this traditional Mini Peanut Puffs (Kok Chai) recipe. I invite you to join the party on social media (Instagram, Twitter, Facebook) with the hashtag #SweetLunarNewYear and #ChineseNewYearCookieParty (for cookie recipes) and share your dessert or cookie creations with us. Tag me @rotinrice so I can see your wonderful creations. Roast ½ cup (70g) cashew nuts in a 350˚F (180˚C) oven for about 20 minutes. Grind toasted cashew nuts until fine. Combine ground cashews, all-purpose flour, and rice flour in a medium sized bowl. Mix well. Partially cook ⅓ cup (46g) whole cashew nuts in 350˚F (180˚C) oven for about 10 minutes. Remove and set aside. Prepare one 2-inch round cookie cutter. Line a baking tray with parchment paper. In a large bowl, cream butter and powdered sugar until light and fluffy. Add vanilla extract and continue to beat for 30 seconds. Add flour mixture into the bowl. Mix with a spatula until it resembles breadcrumbs. Then knead gently until dough comes together. Wrap in plastic and chill for 15 minutes. Place dough in between 2 large pieces of parchment paper. Roll out dough to about ¼ inch thick. Dip a cookie cutter in flour. Cut out as many circles as possible. Lift cut out cookie dough with a butter knife or spatula and transfer to lined baking tray. Rework trimmed dough until all dough is used up. Press a partially cooked cashew nut into each cookie dough. Brush top of cookie and cashew nut with egg wash.
Bake in a 350°F (180°C) oven for 10 to 12 minutes or until lightly brown. Transfer to a wire rack to cool completely. Store in air tight container for up to two weeks. Wish you all a very HAPPY CHINESE NEW YEAR. May the YEAR OF THE ROOSTER bring you good health, much joy, and great prosperity! 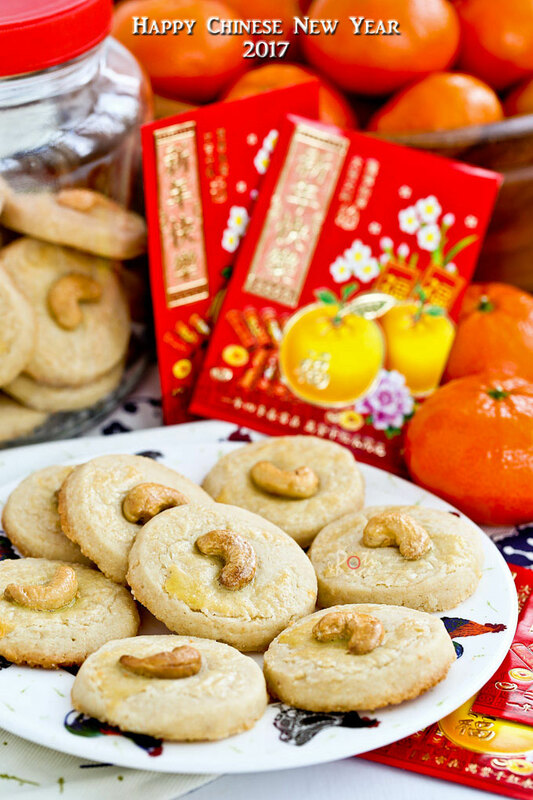 Chinese New Year is not the same without some kind of nut cookies. I love cashew just as much as peanuts. These won’t last long around me! 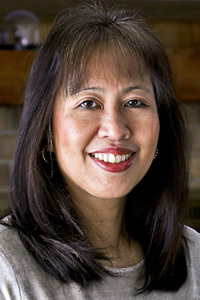 Thank you Christine for organizing this fun virtual CNY Cookie party. Good to see so many yummy recipes in one place. Thank you, Anita. Cookies with nuts are such a treat. Glad to be able to enjoy them every now and then. Yum! These look beautiful! Happy new year! Doubling the recipe is a must! I am sure I can eat a dozen in one sitting. 😛 Happy Chinese New Year! These cookies looks yummy!! delicious. Do you make eggfree cashew cookies. I am allergic to eggs. I have many egg free cookies on this blog. Please check out this link to see all the cookies.